Much has been written about this New York City tattooist. He seems to have been the focal point for the press for his generation of tattoo artists. Charlie Wagner worked the Bowery for over 50 years starting in the1890s until his death in 1953. This fact alone may explain the amount of press coverage that he received. Wagner was not undeserving of this attention based on the quality of his tattooing alone. To his credit, he tattooed some of the major attractions of that era in addition to his other claims to fame. 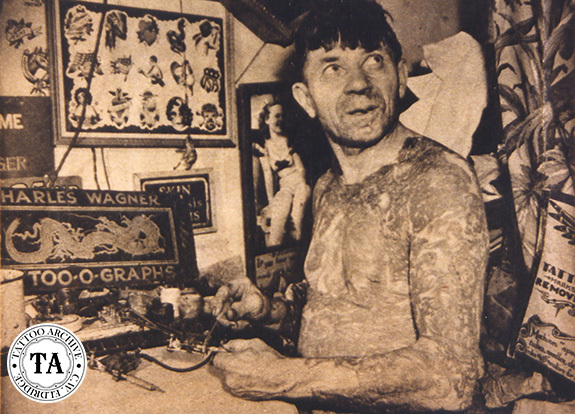 One of Wagner's more important contributions was his tattoo machine ideas that he patented in 1904. This patent was the first tattoo machine patented with coils in a vertical position, that is, in line with the tube assembly. This was a major improvement on machine design; in fact most machines built today use this alignment. Another of Charlie's endeavors that is not well known today was his supply business. The patenting of his machine idea in 1904 may have been the spark that set off his supply business. We don't know if this 1904 tattoo machine was ever manufactured in any numbers and to date, none are known to exist. With the expert help of Bill Jones, Wagner probably sold many tattoo machines throughout the years. 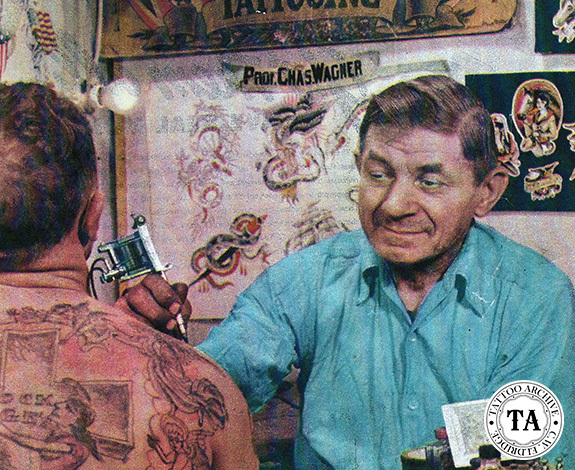 A few years ago, the Archive came across a Charles Wagner Tattoo Supply pricelist! It was mailed to Fred Marquand in the 1920s. It was simply a list of items and prices rather than a catalog. 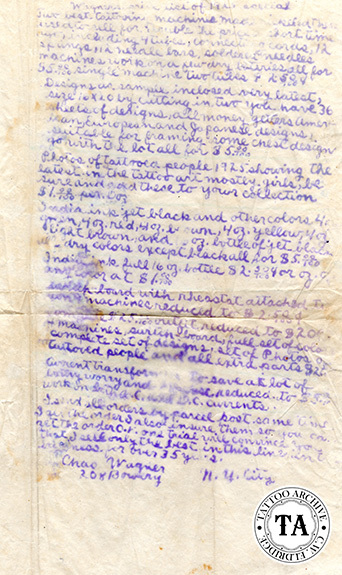 Handwritten on an 8.5 x 11" sheet of paper, it was a mimeographed copy of an inventory of items. There were no illustrations and no photographs. There were a few flash samples enclosed but they were poorly printed in gray ink on thin paper. This is a bit of a surprise coming from the man who was billed as the "Michelangelo of Tattooing”. Other suppliers of that era, like Waters and Miller, sold their wares through very fancy multi-paged catalogs showing photographs of their machines and pages of illustrations of the flash that they offered. In a 1925 letter, Wagner seemed sure that he did not need the added expense of the fancy catalog to sell his items. This is a far cry from what his competitors were turning out. 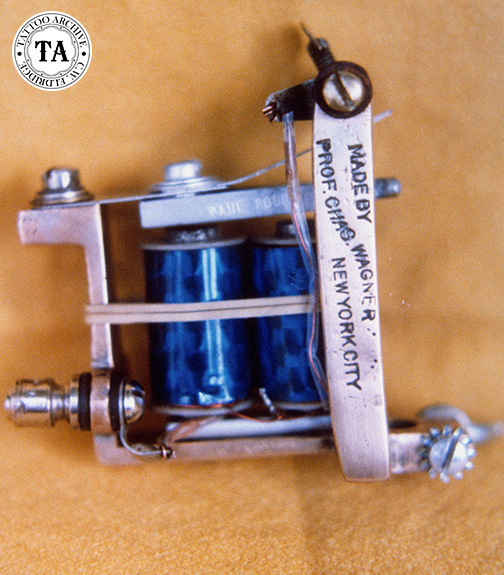 In this direct quote from his letter, (and note the spelling and choppy sentences), Wagner said, "Eventually you will buy frome (sic) me as I am the only one having a U.S. patent tattooing machine and electric devices issued by the U.S. Patent Office, no other supply house can show you these machines, (they) are the best, none better at any price anywhere." This letter was signed, "I remain Prof. Chas. Wagner, 208 Bowery, N.Y. City." Albert Parry in his book Tattoo, Secrets of a Strange Art, notes that there were four suppliers who advertised during the Depression, but Wagner was not among them. Tattoo legend has it that Wagner lost a small fortune in the Wall Street Crash of 1929. In the years after the crash, Wagner could be seen at the front of his shop in an effort to pull in potential customers. By the 1940s with World War II these supplier ads were back, along with Wagner's good fortune. In formulating this article, a couple of questions came to mind. Why does a simple mimeographed price list seem out of place for a tattooist who worked so hard to cultivate an urban sophisticated image? And why, if his supply business was so successful, have so few of his wares survived? 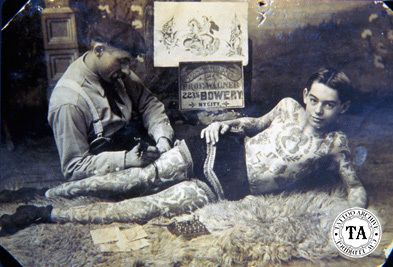 Charlie Wagner, one of America's great tattoo legends tattooed in New York City from the 1890s up until his death in 1953. Working on the Bowery in lower Manhattan, Wagner took over the shop space at 11 Chatham Square that Samuel O 'Reilly had occupied. As a matter of fact, Charlie Wagner really carried on where O'Reilly left off in more ways than one. They both patented a tattooing machine, and both became very famous for tattooing sideshow attractions. Samuel O'Reilly patented the first tattooing machine in 1891 (patent #464,801). Wagner improved upon that design and received his own patent in 1904 (768,413). It is said that would-be sideshow attractions flocked to O'Reilly after hearing about his new tattooing device believing that it would be faster and less painful to acquire the necessary coverage for show business work. After O'Reilly's death in 1909, Charlie Wagner took over much of this attraction business and went on to establish himself as one of the major forces in the tattoo world. Charlie Wagner is said to have tattooed 50 attractions during his career, including Betty Broadbent, Clara Clark, Mildred Hull, Charles Craddock and Joseph Cook, to name but a few. New York City Tattoo: The Oral History of An Urban Art, written by Michael McCabe and published by Hardy Marks Publications is a wonderful book on Wagner and other New York City tattooists. Learn more about Charlie Wagner in The Life & Times: Charlie Wagner found in our online store.